Last year I did a user management and single sign-on (SSO) implementation for the Worldwide Anti-malarial Resistance Network (www.wwarn.org), after much clattering about with various pieces of software I settled on the following. Drupal has built-in features for user registration and management, and we had already decided to use Drupal as the CMS for static content, so it made sense to try and re-use these capabilities. Alongside Drupal we deployed CAS, which acts as an SSO authentication server. Drupal and CAS can be made to talk to each other using the Drupal/CAS module, so we installed and configured this. This changes the behaviour of the normal login and logout links in Drupal, so you’re redirected to the CAS login/logout screens instead, and handles ticket validation after you’ve successfully logged in to CAS and been redirected back to Drupal. Rather than deploy a separate user directory or database, we used the Drupal database, i.e., we configured CAS to query the Drupal database directly via JDBC when checking user login credentials. Any Java web applications that we wanted to integrate with the CAS SSO service were integrated using the Spring Security CAS implementation. Any other web applications could be integrated using mod_auth_cas, if running as a CGI-style application under Apache, or if running behind Apache as a reverse proxy by using the pre-authentication pattern. The only coding needed to make this all happen was the cosmetic work needed to make the CAS login and logout screens look like part of the same website, which was fairly straightforward. The diagram below is a bit rough around the edges, but hopefully it gives an outline of how this is all setup. Note that there are no restrictions on where any of these components are hosted. I.e., CAS, Drupal, and the webapps could all be hosted on different servers on different networks, or all on the same computer, it doesn’t matter, as long as they can talk to each other. For WWARN we also used Drupal to define and assign roles to users, which were then used by other applications to implement authorisation policies, but this isn’t necessary to achieve SSO authentication. 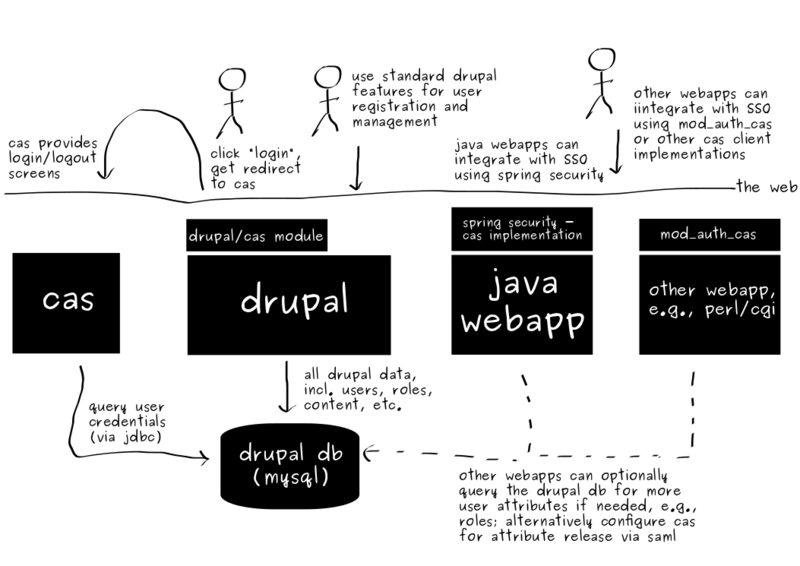 To use Drupal for role management the other applications also had to query the Drupal database, however I believe this could also be achieved via SAML attribute release, which would remove the need for extra JDBC communication.